Rebekah and I often often tweet ideas for notebook time, and recently many of you have been asking us to explain it and show how it fits into the workshop. Put simply, notebook time is an opportunity for students to play in their notebooks with different ideas, information, and genres. In our classrooms, notebook time occurs at the beginning of class as a prelude to the minilesson and writing/conferring that will happen later. It usually lasts between 4 and 6 minutes, leaving 5-15 minutes for the writing lesson and 20+ minutes for writing and conferring in our 46 minute block. After Penny planted this seed, we brainstormed all the other kinds of information we might bring to students at the beginning of class to inspire thinking and writing. We call these Notebook Time Invitations. Sentence Study – Invite students to mimic a well crafted sentence found in your own reading or class texts. Adaptable Poems – Invite students to mimic the structure of a poem or to use the first line as a starting point. Raw Data – Invite students to examine raw data/statistics, using the following guiding questions: What do you see/not see? What does it say/not say? What kinds of writing might bubble up from this data? Quickwrite Inspiration – Invite students to explore the answer to a question or prompt. Spoken Word – Invite students to watch a spoken word artist perform a poem and mimic the structure of the poem or use the first line as a starting point. Our old post Sentence Study with Anna Quindlen will give you a good sense of how to conduct notebook time in the early days until students are able to work independently with little introduction or instruction. With so many options for notebook time, how do we select invitations? Below I’ve outlined several possibilities that have worked for us in the past. Possibility: Choose invitations that correspond to the current unit of study with the thought that students might be able to generate work during this time that could feed their current writing. Possibility: In the last week or so of a study, give students a sneak preview of the next unit of study by choosing notebook time invitations that correspond to that genre or technique. Possibility: The themes of notebook time do not have to correspond with your current unit of study at all. Mix and match types and genres to remind students that writers play inside and outside of their work all the time. 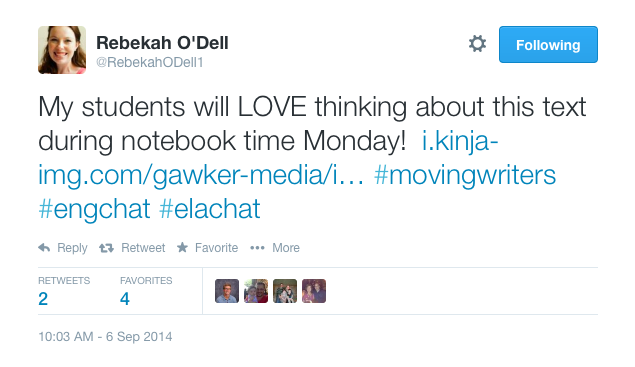 Possibility: Invite students to share their own ideas for notebook time. Pass around a monthly calendar and have students sign-up for a day. Students could email you their NBTI the day/night before. Does Notebook Time Really Work? In my experience, I can point to notebook time as the sole factor in my students’ increasing appetites for writerly play and risk-taking. And the invitations work so well because they are just that: invitations. We invite students to experiment. “See what comes up in the next four minutes,” we say. We invite them to share an idea, a line, the whole thing at the end of the four minutes. (Sometimes they beg for additional minutes). We invite them to write without evaluation. (We don’t grade NBTI). We simply invite them to “keep their hands moving for four minutes.” The stakes are low. The sense of possibility is high. It’s rare that we catch a student just sitting there, wasting away this time. But if we do–and it’s not a pattern–we allow it. Notebook time is an invitation to write, and sometimes to write, we have to pause, pens perched above the notebook, eyes staring into the abyss of the white page…and just think. Below you’ll find one week’s worth of notebook time invitations! Please leave a comment below or tweet us @allisonmarchett and @rebekahodell1 to share students’ responses or your experience with notebook time this week! Thursday – Quickwrite Inspiration: Tell me about your mother’s hands. Go. Rebekah and I have collected all of our favorite NBTIs in our Mentor Text Dropbox. Click on Notebook Time, and search through the different categories for inspiration! Please shoot us an email if you have a NBTI to share, and we’ll gladly add it to our collection. officials such as Banks industry, public parks, housing or residence development, and parking garages. This is seriously amazing. I feel like this is related to what I’ve been doing for the last several years, but this is SO much more AWESOME! Thank you for this blog because it is a wonderful resource! We’re so glad you found us! Let us know if there is something specific you’d like to see on the blog. Hope you’re having a great summer.